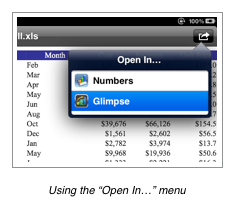 ☞ Note: Glimpse supports Excel ’97 and Apple iWork Numbers 2007 and higher. Glimpse requires that spreadsheets have distinct (i.e., non-repeated) columns names on the very first row of the spreadsheet, and that each row in the spreadsheet have the same number of rows as well as the same type of data. Spreadsheets can be sparse, in that they can have some empty cells, but note that when importing a spreadsheet, Glimpse looks at the first 100 rows to automatically identify the type of data. Thus, if the first 100 instances of a column don’t have any values in them, Glimpse may not be able to automatically identify the type of data in that particular column. ☞ Note: Depending on the amount of memory on the iPad, large spreadsheets might take a long time to import. If a spreadsheet is too large to import directly, you may wish to first convert it to a .csv file before importing. You can import your formatted data from the clipboard by copying it to the iPad clipboard from another source (such as an HTML table in Safari or comma-separated text from an e-mail), and then tapping the “Import” icon in the document picker in Glimpse. 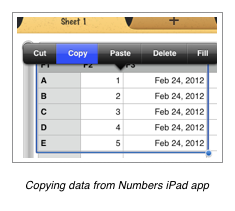 ☞ Note: Importing from the clipboard has the same requirements as importing from other spreadsheets. Namely, the first row must contain column names, and subsequent rows must all contain the same number of columns. Mail yourself an attachment in one of Glimpse’s supported formats, then download the attachment in the Mail app and tap “Open in Glimpse”. Transfer a file using iTunes File Sharing by selecting your iPad in iTunes, clicking the “Apps” tab, and then selecting “Glimpse” in the list of apps under “File Sharing” at the bottom of the iTunes window. 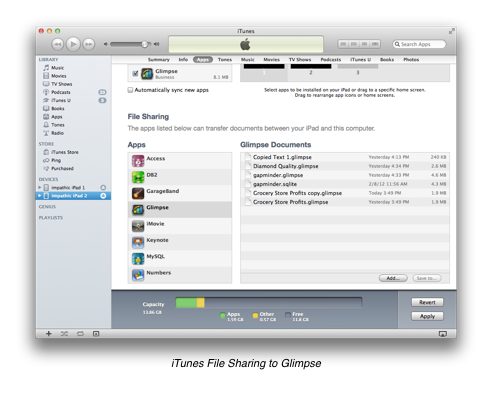 You can then drag a file in any of Glimpse’s supported formats into the “Glimpse Documents” section. The file will then appear in the list of available files when the “Import” button is tapped. Use the Dropbox app to transfer files from your desktop, and then select “Open In”. 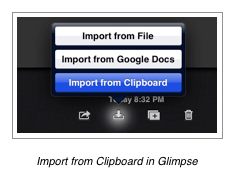 Glimpse should appear as one of the apps that is able to handle the file type. ☞ Note: It is not currently possible to update a Glimpse file with new data in a spreadsheet. When the spreadsheet is changed, it much be imported as a new Glimpse.